Here are some photographs of a setup for Sidney LeVasseur's game Kings Court, pieced together from Chess Construction Set materials. 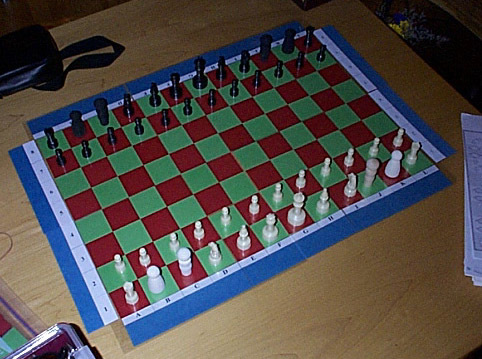 The board is made from 1.75" posterboard tiles which David Howe made into mats by taping and laminating the tiles together. He also made the rank and column markers which are used here. 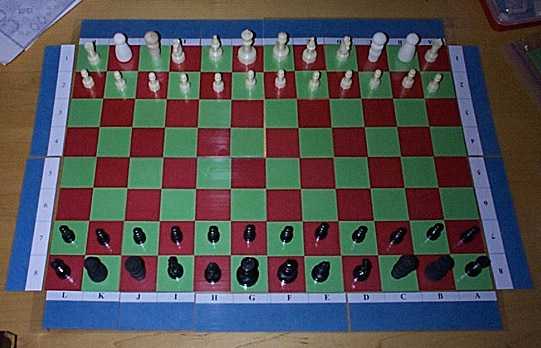 The regular Chess pieces used are from Fergus Duniho's medium sized Chess sets. The Chancellor and Jester are wooden people Fergus bought in a craft store and painted black and ivory. The Jester piece, besides looking like a man in a robe, looks like a cap with a ball on top. It is because of this resemblance to a fool's cap that we chose it for the Jester piece. The Chancellor piece is a wooden woman. Kings Court Photographs. Photo's of oblong 12 by 8 chess variant. Author: Fergus Duniho. Inventor: Sidney LeVasseur.